Passing through Geneva airport on my way skiing last week made me think of the Large Hadron Collider. The recent news from CERN has been very good. Quietly and without fuss, the LHC got back into business last month and in the brief period before the Christmas powerdown, a great many elementary particles were detected (‘rediscovered’) whose original discovery took years of labour. It’s very satisfying to see science repeat itself like this – a retro tour of the Standard Model before the stage is set for the next step. And the news on the next step is also good as the Collider has already broken several new energy records, finally bringing us into a new regime of high energy physics. Below is a nice summary of what has been achieved so far, taken from Jim Pivarski’s blog The Everything Seminar – I think it gives a really good insight into how particle physics is done. * The two with asterisks require qualification: see below. The muon is an easy one: as soon as the tracking detectors were turned on, they saw muons raining down from cosmic rays. CMS collected hundreds of millions of muons in a month-long campaign in 2008, the basis of 23 detector-commissioning papers submitted to JINST (a personal point for me, since I edited one of those papers). Muons originating from proton collisions are more rare, but were observed. The neutral pion (π0) was seen in the first 900 GeV LHC collisions this November. Most of the charged particles produced in proton collisions are also pions (π+ and π–), and the tracking detectors saw plenty of tracks originating from the collision point as well. But the first LHC run required the experiments’ magnetic fields to be turned off to avoid complicating the orbits of the proton beams, and this meant that all of the tracks from charged collision products were straight lines, providing little information about their momenta. The energy of the two photons (γγ) from neutral pion decays (π0→ γγ), measured by calorimeters, gives us a handle on the mass of the parent particle, and therefore confirm it definitively as a π0. The distributions above are histograms of , calculated for pairs of observed particles (1 and 2). More charged pion pairs have an invariant mass of 0.497 GeV than would be expected from random combinations, so we see a K-short peak (KS) on top of a low, flat background. 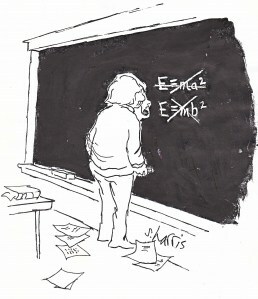 Similarly, pairs of protons and π–, and of antiprotons and π+, pile up at 1.116 GeV, the neutral Lambda (Λ0) mass. Red lines are fits to the distributions and the blue lines are the masses measured from experiments before the LHC. When I flew home from CERN yesterday, I couldn’t resist and brought a reduced sample from the dataset with me on the plane. Poking around, finding vertices where pairs of charged particle tracks intersect and calculating their masses, I saw our two friends KS and Λ0 and tried looking for more. It reminded me of why I became an experimental physicist: these things really are there! The guy next to me on the plane asked if I was programming, and I had to say, “not exactly,” because even though it looks like computer work, it’s reaching beyond the computer to something physical, if not tangible, that was happening inside a beryllium beampipe in France. The beam quality was better in some runs than others, and you could see that in the backgrounds. The wireframe cylinder shows where the tracking detector is, with the yellow lines being tracks of charged particles from the collision. On top of that, red and blue bars show where the calorimeters (surrounding the tracking detector) registered energy. The tracks and calorimeter energy are clustered into two apparent jets, indicated by the yellow cones. This is as much of a quark or gluon as nature will ever allow us to see. On Monday, the LHC gave the experiments a few hours of record-breaking 2.36 TeV collisions. At high collision energies, the production rate of more massive particles increases. One intriguing event from this run contains not just one muon, but two. Moreover, the invariant mass of this pair is 3.03 GeV, consistent with J/ψ→μμ, where the J/ψ mass is 3.097 GeV. This event alone is not a “J/ψ observation” because other processes yield muon pairs— imagine one of the invariant mass plots above with a single event in it. That event has the right mass to be in the peak of the distribution, though. This display shows three views of the event, including the muon detector measurements that identify the two long, red tracks as muons. Of all the stable charged particles that originate in proton collisions, only muons pass through enough steel to reach the muon detectors. Thus, seeing anything at all in these detectors, matched to a track in the central detector, is a pretty clean muon identification. Some of the (older) professors I worked with in grad school told stories about the November Revolution, the 1974 discovery of the J/ψ that changed particle physics overnight. Up to that point, all of the major ideas of the Standard Model had been expressed in one form or another, but had not jelled into the single picture we know today. One of these ideas was that the strange-flavored quark should have a charm-flavored counterpart— a patch on the quark theory to avoid neutral flavor-changing decays through Z bosons that were not observed (the GIM mechanism). The dramatic J/ψ resonance discovered months later (thousands of events with little background) could only be explained as a charm-anticharm bound state, which lent a lot of credibility to the quark model for making such a prediction, and made W and Z bosons concievable, as long as there’s also a Higgs boson to generate their masses— one by one, the pieces of the Standard Model fell into place. According to James Bjorken, the whole theory was complete by 1976, though people tell me that they weren’t convinced until the early 80’s when W, Z, and gluon jets were observed. It turned the field from a collection of puzzling observations into a Theory of Almost Everything, and a search for hints of physics beyond the Standard Model. Hopefully, we’ll get back into the business of puzzling observations soon enough.